After all the hard work through veg and flower, the time has finally come. You are ready to harvest. While most of the hard work is over, it is crucial to execute your harvest, dry, and cure to perfection. If you make mistakes now, all your time, energy, and money spent over the plants life cycle will be for not. There are many intricacies to consider, such as the right time to harvest, how you will trim, and drying and curing strategies. Keep reading to ensure your first harvest is a successful one! Harvesting your plants will be the most exciting part of cultivating your plants. The harvest can be very simple, especially compared to other aspects of growing. There are still a few key aspects to keep in mind to ensure that you have as successful and easy of a harvest as possible. Timing is everything when it comes to harvest. You will need to pay attention to your flowers, and the pistils and trichomes in particular. Every plant is different, but generally, there are tell tale signs that it is time to cut your plants down. A pocket microscope can be incredibly helpful when determining if your plant is ready for harvest or not. 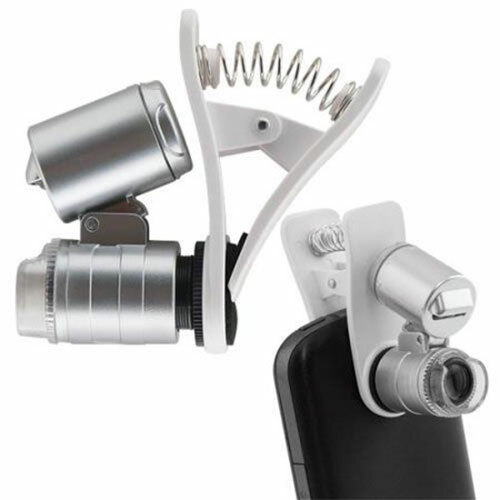 As your plant matures, the pocket microscope can be used to view the plant’s trichomes in much greater detail. The older the plant grows, the more these trichomes will begin to change color, beginning as clear, then becoming cloudy or milky, then eventually turning amber. Most growers wait to harvest until the majority of their trichomes look milky, with a small percentage (20-30%) looking amber. These trichomes contribute to the overall effect it will have on you when ingested. Cloudy trichomes contribute to a more heady or cerebral effect, while amber trichomes have a more profound effect on the body. As a grower, this is an opportunity for you to play around and control the effects your plant delivers. Keep in mind, though, the genetics of your strain will be the dominant factor in the effects of consumption, and certain plants should be harvested at different times. Know your genetics! When should I flush my plants? A crucial aspect of preparing for harvest is the flushing of your plants. The majority of growers utilize a variety of nutrients throughout the plant’s life cycle to keep the plants alive and encourage more robust growth. The flushing process removes all of the nutrients that are still residing within the plant. This will result in a smoother, better tasting final product. Without flushing excess nutrients, you will be consuming them when you consume your plant. One to two weeks before harvest, the plants should not be given any more nutrients, and instead should only be given pure water. This will completely flush the plants and make them safe for ingesting. If your plants are not flushed prior to being harvested you put yourself, as well as anyone else who ingests the finished product, at risk. To supercharge your flush, use a special flushing agent. These contain special chelates to more effectively grab and remove excess nutrients within the plant. If you are new to harvesting, it is likely you will do so by hand. The quality of a hand manicured bud is unrivaled, and when possible, we always recommend to trim by hand. However, as your plant count increases, or if you are a commercial grower, trimming by hand will become impossible. At a certain point, you will need a trimming machine. Nothing beats a hand-trimmed bud! For the sake of this article, we will assume you are trimming by hand. To make the process easy on yourself, all of the necessary items should be gathered prior to starting. You will need a pair of pruners, trimming scissors, a bag for any waste such as old grow media or dead leaves, and some way to hang the harvested plants. High quality trimming scissors will make a world of difference in your trimming experience. You are going to spend hours upon hours using these bud trimmers, so invest in a high-quality, ergonomic pair to save your hand from cramping. If you skimp on a cheap pair of trimming scissors, you will likely end up needing to buy multiple pairs. The sticky residue from your plants will wreak havoc on a weak pair of scissors. Once you have your materials ready, it is time to prepare your grow room. If you use any form of CO2, it should be turned off, since harvested plants will not benefit from it. The grow lights can also be shut off, as the plants are soon to be dead and will not be needing them any longer. Turning these off saves you from having to work under incredibly hot and bright lights, which makes the whole process a bit more comfortable. 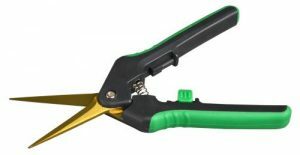 Trimming your plants by manicuring branches right after they are cut off is known as wet trimming. After you trim your buds, you will then allow them to dry. The alternative method is trimming dry, which requires first drying your branches. This method is more typical of commercial grows or harvests where time is of the essence. If you are new to growing and just have a few plants, harvesting wet is fine. This will generally result in a higher quality final product, since fewer trichomes are lost as opposed to dry trimming. Wet trimming allows for more precision when manicuring. 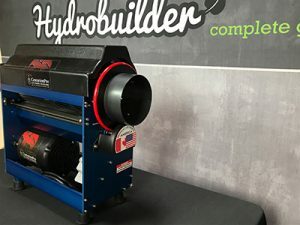 Trimming machines are a must have for commercial growers. As soon as your plants are ripe and ready, cut off stalks with your pruning shears, and manicure them one by one. New growers are commonly wondering how to tell if they have adequately trimmed their buds. The truth is, you can manicure as much as you want. The less leafy material present, the smoother and better tasting the bud will be. To make this step easier, remove large fan leaves a day before you harvest. Try to keep as much as your trim as possible. You can use this later to create tasty and potent extracts, ensuring you get the most out of your plants. Once all of the plants are chopped, de-fanned, and trimmed, the harvest process is done! But not exactly. If you trimmed wet, you still need to dry your buds. 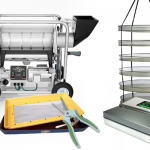 A complete harvest, drying, and curing kit will ensure you are fully prepared to harvest! Now that your plants have all been harvested, it is time to focus on the process of drying your harvested goods correctly. The environmental conditions to aim for when drying is 70 degrees Fahrenheit, and 50% humidity. Just as the optimal environment is necessary for propagation, vegging, and flowering, it is also essential during drying and curing. Do not ruin your crop at this stage by allowing excess moisture in. An inline fan can be used to exhaust air to help control humidity, just as when growing. Oscillating fans can also be utilized to ensure good air circulation. If you live in an area with particularly high humidity, you may need to invest in a dehumidifier, as a drying room with high humidity could potentially ruin an entire crop. The drying plants should be checked on daily to ensure that there are no issues arising, such as mold or rot. As long as the environment is well maintained, there should be nothing to worry about! If you are looking for the most effective way to dry your plants, you have a few options. The method in which you dry your plants matters significantly less than the environment in which you do it in. A common mistake new growers make is thinking that they can bump the heat up and speed up drying. This is a bad idea, and will lead to your buds becoming very brittle and harsh. A slow, controlled dry will drastically improve quality. Drying racks are a great way to conserve space while drying. These are multi-chambered mesh containers designed to remove moisture from your buds at an even rate. If a tent was used to grow the plants, this is typically the best environment to dry them in as well. Grow tents make maintaining an ideal environment easy and any equipment you need will likely already be set up. Without a grow tent, you will need to set up a separate room with the perfect environment, and constantly control that environment. 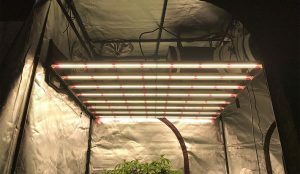 This can be very difficult, and often times, more expensive than just purchasing a complete harvest, drying, and curing kit. 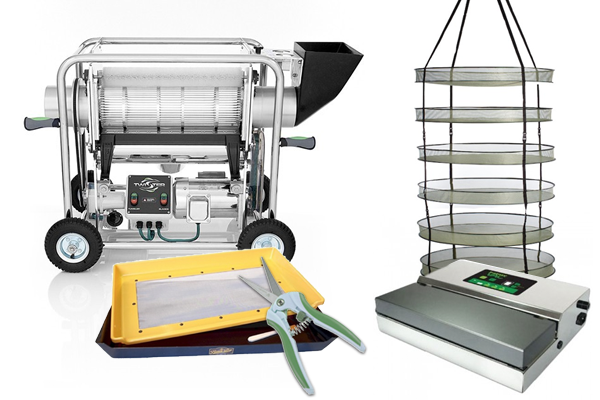 If you do not have the ability to create the right drying environment with your current equipment, or just want to make life easier, consider a harvesting, drying, and curing kit. 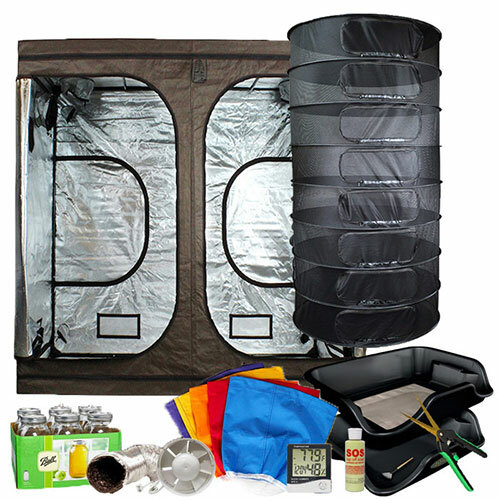 Grow Tent - Maintains a clean space that temps and humidity levels can be easily managed in. Drying Racks - For drying when trimming wet. Remove rack and hang on stem when dry trimming. Ventilation System - Removes excess heat and humidity during the drying process. Circulation Fan - Clip fan circulates air in the tent while drying. Trimming Tray - For the hand trimming connoisseur, this tool is extremely useful if you are dry trimming. Scissor Cleaner - To keep the trimming scissors clean of resin to keep up productivity. Glass Storage Jars - No better way to store your high quality flowers. Bubble Bags - For processing your left over trim after you are done with your harvest. Typically, the plants will be done drying in around 7-10 days. This can be easily checked by applying pressure to the branches. If it snaps, then it is dry. If it just bends, then it still needs a bit more time. Be patient, and understand that the drying and curing steps contribute to whether your harvest is successful or not. It can be easy to rush this process, but it is worth the wait. Once completely dry, you can begin the curing process. Once your buds are properly trimmed and dried, they are ready for the final part of the process, the cure! This is where your buds can finish developing their full aroma and flavor, and an extra step that often separates the amateurs from the pros. 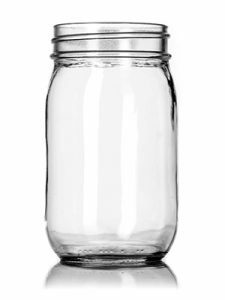 The dried buds should be placed into airtight mason jars, and each jar should be about ¾ full. Filling the jars to capacity would give the buds no room to breathe. Because of this, they would compact into a clump and mold could quickly spread. After filling the jars ¾ of the way, the jars should be sealed and stored in a cool, dark location. It is extremely important that the jars are opened at minimum once a day. This will release any excess humidity, allow in fresh air, and give you an opportunity to inspect the buds. This ensures that they are curing properly and no issues are developing. This process of “burping” the jars once a day should continue for at least the first several weeks of the cure process. It may feel tedious, but it helps prevent your harvest from being spoiled! How long should I cure my buds? Your flower is like a fine wine, it gets better with time. You shouldn't even think about consuming your buds until they have had at least 2-3 weeks to cure. If you can manage to stay patient, cure for up to 8 weeks. 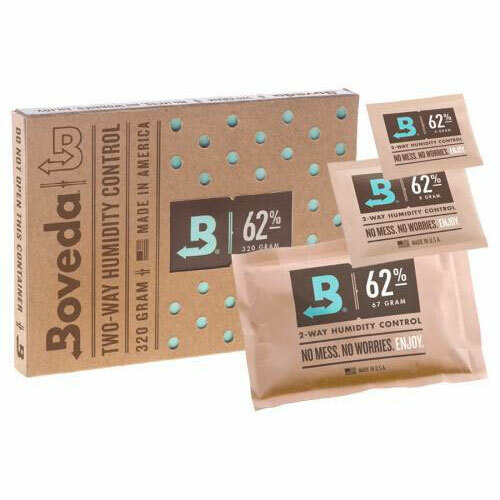 This will ensure your buds have had all the time they need to continue ripening to their full potency. If quality is your pursuit, do not overlook this essential process. It can be tough to wait an additional 2-3 months after harvest, especially if it is your first grow and you want to test your buds. I promise the wait is worth it. The drying process can be tough for new growers, and often times buds will become too brittle. This leads to a harsher consumption. To combat this, we recommend using humidiccant packs. These small pouches sit inside of the jar that you are using to cure your product, and they will either absorb or release moisture to keep the relative humidity right where you want it, which for curing, is about 60%. I have stored my buds in curing jars....now what? After completing all this, you should focus on completely cleaning and sanitizing every piece of grow equipment that you have to prepare for your next cycle. You should have been keeping a grow room journal, and at this point it should be finalized. You now have your first harvest behind you, and you will have learned a ton. Your next growing cycle will be much easier, especially if you kept a detailed checklist. To kill time and distract you from your curing buds, plant your next seeds, or tend to the clones you may have taken during your first grow. The two or more months spent growing your plants is no small task. However, the harvest is just as important as any part of the process, and should not be seen as a time to just coast or let your guard down. Even once the plants are completely chopped down there is still the potential for issues such as mold and mildew to appear and rob you of an otherwise bountiful harvest. Remain vigilant, control your environment, give those plants the attention they deserve, and you will ensure yourself a successful harvest. To find any plant harvest supplies you need, visit our full harvest category. If you still have questions regarding your upcoming harvest, or about any other issue arising in your garden, we are here to help! The rest of the harvest section of our learning center contains tons of valuable information for new growers and experienced green thumbs alike. Give us a call at 888-815-9763 and any of our experienced professionals will be more than happy to help you with whatever you are facing.